Daffy Peeking out of his hiding place! 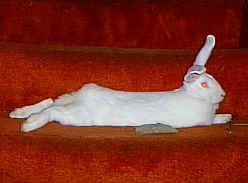 Daffy relaxing on the stairs...check out those ears!!! 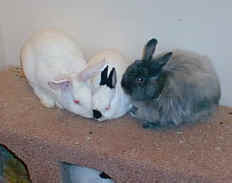 Daffy with Peter and Fluffy having a little "grooming party"
This bunnies name was Daffy and he was one of the babies we rescued from the Ashtabula Humane Society. 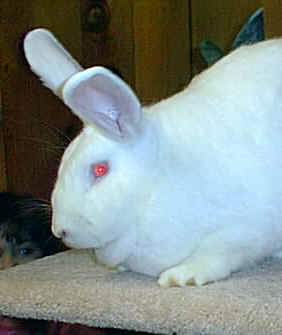 His father was the bunny we adopted earlier named Big Bunny. This bunny actually belonged to my daughter Nicole and she took very good care of him. 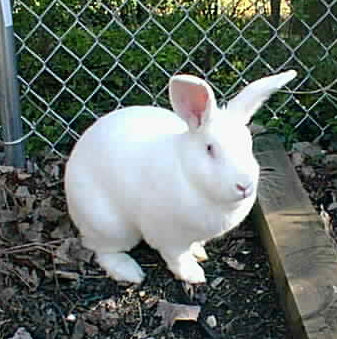 When we first got Daffy, we thought it was a girl since it was pretty small and my daughter named "her" Daisy Mae. Within a few weeks we realized it was definitely a boy and so the name was quite inappropriate! Daffy really settled down and enjoyed running free. These next few pictures show Daffy playing in my backyard. 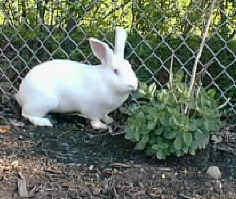 Update: Daffy became sick like several of the other rabbits and then passed away. 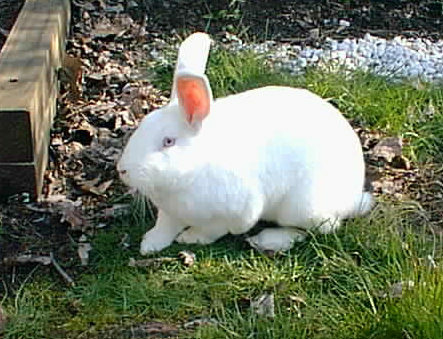 I now believe it is mycotoxin poisoning since all the symptoms the bunnies have been having are consistent with the information from this website: http://www.morfz.com/myco.html In addition, the pet store we have bought our food at for the last 8 years changed their brand of food about 2 months ago. My husband commented how it didn't look or smell as good as the other food. 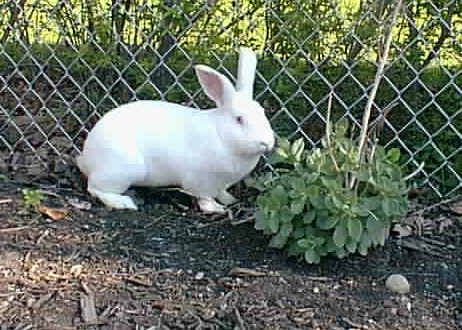 6 weeks after eating this food, the bunnies began getting sick. The bunnies that are sick or that I have lost have had corneal ulcers, liver damage, runny eyes, messy butts, started losing lots of weight and many other things. We have tried several different medications to try to get this to stop. I am not sure I can deal with losing any more bunnies. This has been so hard on me and the kids to deal with and understand. 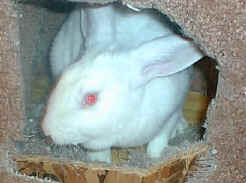 I have changed all my food over to Purina Rabbit Chow and got fresh hay. I am sending some samples of the other food to a lab to test for the mycotoxins. To find out how this story continues, click here to read SweetPea's page or click here to read the story of Mycotoxin poisoning.